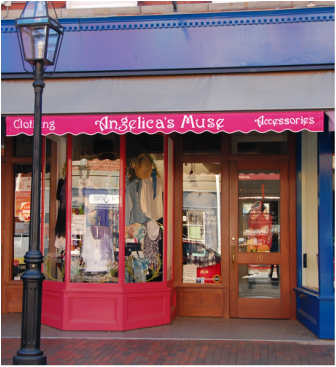 At Angelica’s Muse, we feel that no “body” should feel excluded so you can count on finding your size here no matter what it is. We know our customers and what they are looking for and we keep this in mind when we go on our buying trips. Audrey is another one of the artists that we are fortunate to have among the ranks at Angelica's Muse. She says that being in the store is like being in her studio, and it shows from her beautiful work on our displays. Surrounded by the gorgeous fabrics, and endless colors and textures, inspiration for her work here comes easily. Audrey loves meeting and greeting and helping people, and our customers enjoy reaping the benefits of her process as she always seem to put together just the right outfit with ease.